In this current day and age spending quality family time seems to be the main priority on everybody’s agenda, but very few families seem to have mastered how to fit it in. Lazy Sunday afternoons and spending quality time with grandparents are a distant memory for most… However, our owners feel completely satisfied with the quality time spent on our parks with their loved ones. Owning your own holiday home is the perfect way to re-group with your family and friends and enjoy those special days, where memories are made. Memories, of course, would not be complete without our special furry friends, all of our parks are dog-friendly. Your holiday home can offer you the best of both worlds, peace and tranquillity (if that what ’s needed) or stay connected to the outside world through our free wifi, which is available on all our parks. The choice is yours! Don’t take our word for it, here’s what some of our owners have to say about our parks and the lifestyle!! 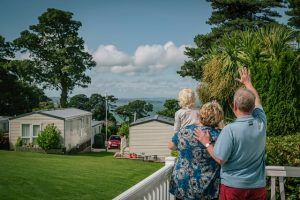 “We initially looked at several parks in the Pwllheli, Abersoch and Llanbedrog area, but had previously stayed at Ocean Heights and were impressed with the personable, friendly staff and the immaculate /well-maintained gardens. Facilities for the children were on our wish list. The park and play areas are beautiful and there are lots of free, safe, open spaces for the children to roam and explore in. Owning a holiday home gives us the ‘down time’ we need from the hectic 9–5 lifestyle. It’s also better than owning ‘bricks and mortar’ holiday homes as the sense of community and independence it gives the children are amazing. The local area is stunning. The scenery is quite frankly breath-taking – with the backdrop of Snowdonia, lots of beach walks and ‘green walks’ in the immediate vicinity. There’s so much to choose from with an hour’s radius – ranging from adrenaline activities at some of the zip world locations, history and tranquillity at CADW and National Trust sites, or free activities when spending many sunshiny days on the multiple beaches in the area. We decided to buy as it was much more affordable than we initially thought, and we found just the perfect caravan on the most adorable plot. We’ve never looked back and look for any excuse to escape to our little ‘bolt hole’. 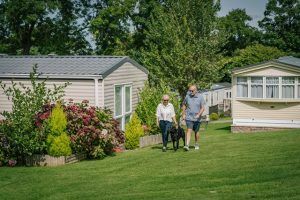 Thornley parks offer great value for money, a very personal and individual service, and the staff almost feel like they become part of our extended family.